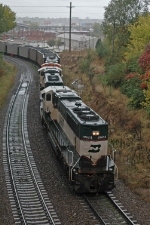 Description: A DPU on an empty coal train departing Vancouver, WA. Description: Serial Number, 966706-49. Built July 1997 for BNSF. Description: K142 crosses from 2 to 4 at Locust at 1555. Description: River Trail at 1555. Description: BNSF 9824 serves as DPU on an empty AECX coal train as it works through Old Monroe, Mo. on the BNSF Hannibal Sub.